WASHINGTON (Reuters) - Turkmenistan has told Pakistan officials that it can supply enough natural gas to justify building a pipeline from the gas-rich Central Asian nation to energy-starved Pakistan and India, a Pakistan government adviser said on Friday. Pakistan is in active talks with Turkmenistan to build a pipeline that would run through war-torn Afghanistan, but it is also pursuing a plan to build a $7.4 billion pipeline from Iran that would also supply India, said Mukhtar Ahmed, energy adviser to Pakistan Prime Minister Shaukat Aziz. "We have been assured in writing by the Turkmens that the required amount of gas will be made available notwithstanding these other commitments," Ahmed said at a conference hosted by the Woodrow Wilson Center. "The credibility of these assurances is something we can talk about indefinitely," he said. Turkmenistan is also pursuing export deals with Russia, Ukraine, and China, raising questions whether it will have enough supplies for other customers. Paul Simons, a deputy assistant secretary at the U.S. State Department, said that the Turkmen natural gas pipeline "deserves a close look" but reiterated that the Bush administration opposes any pipeline to Iran. Western nations including the United States have accused Tehran of attempting to develop nuclear weapons, which Iran denies. Pakistan energy officials will be in Washington on Monday for meetings with Energy Department, State Department and other U.S. officials, Simons said. "The government of Pakistan is well aware of the fact that we are not in favor of Pakistan moving ahead with this pipeline to Iran," Simons said. Instead, Simons said Pakistan should tap domestic natural gas supplies, build transmission lines to import power from neighbors like Kyrgyzstan and ship in liquefied natural gas (LNG) from places like Qatar, Indonesia and Nigeria. Earlier, Ahmed said he hoped to convince the Bush administration that the Iran project was worth pursuing. "The rationale for the project is very strong," Ahmed told Reuters in an interview. "We hope that at the end of the day everybody including our friends in the United States will be able to see the wisdom of implementing this project." Officials from Pakistan, Iran and India will meet in New Delhi next month to negotiate gas pricing before finalizing a deal to pipe Iranian gas to India through Pakistan, Ahmed said. Future demand would justify both the Iran and Turkmenistan projects being built, he said. Filling Pakistan's rising demand through LNG "is probably not a realistic assessment," he later said, because major world exporters like Qatar have committed future supplies elsewhere. Pakistan's need is urgent because its energy demand will quadruple over the next 20 years, he said. The 150 million cubic meters per day pipeline through Pakistan would link Iran, which holds the globe's second largest gas reserves behind Russia, to India. Gas supplies from Turkmenistan hinge on its Dauletabad gas field which contains a gigantic 4.5 trillion cubic meters in reserves, according to Turkmen estimates. Turkmenistan produces just under 60 billion cubic meters of gas a year and exports two-thirds of that, mostly through an ex-Soviet pipeline that runs to Russia and for which it gets below-market prices. Last year Turkmenistan appointed independent auditors of its oil and gas reserves. "I have looked at numbers which indicate that there is enough gas in the ground (in Turkmenistan) to support a 30-year project for Pakistan and India," Ahmed said. "The numbers seem to be credible." I do not understand what the map shows. 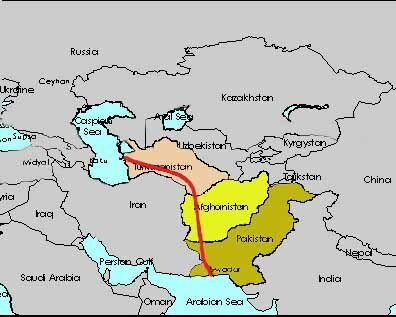 Proposed gas pipeline route from Turkmenistan to Pakistan - the map is just an estimate- I picked it up from a website just to explain general geography of the project. But I thought it might also extend to India. In that case, how will it look like? Actually, you are right - it will almost certainly go to India and the line will look different. However, I think it will also go towards Gawadar port for its onward movement to other destinations.